Bill Ward and Tony Iommi of Black Sabbath looked back on their band’s most fruitful years at an event to promote their new boxset release, The Ten Year War. The release, which compiles the band’s first eight albums, from their 1970 self-titled debut through to 1978’s Never Say Die!, is named for the band’s long-standing wrangles with the press during their early years, with a pamphlet of the same name reproduced for the new box set. The music has been restored to the highest grade format available, MQA audio, designed to offer the best quality audio possible for streaming services. Claiming to offer a resolution comparible to CD, the albums are included on MQA on a USB drive in the shape of the band’s infamous inverted cross as part of the boxset, and will be streaming as part of Tidal’s ‘Masters’ series of MQA-quality streams. 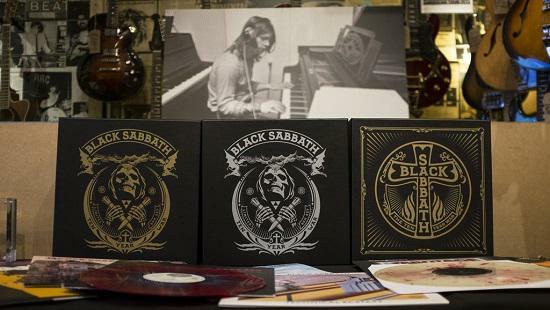 The launch event was held in Regent Sounds Studios in London, now a guitar shop, in the very room where Sabbath’s first two records were recorded. Iommi was interviewed live on stage, while Bill Ward, who was omitted from the line-up on the band’s farewell tour after a shoulder injury and subsequent fall-out with singer Ozzy Osbourne, sent a video message projected to a small but eager crowd. The Ten Year War is released on September 29 via BMG, for all the details, click here. For more on MQA, click here.